Update: Between yesterday and today, the amount raised by the wheat fields shot up to $1,015 US dollars, which places AM Radio in the third position of top fundraisers for Team Heifer. His new goal: 3 cows or $1,500 by Thanksgiving. Can he do it? 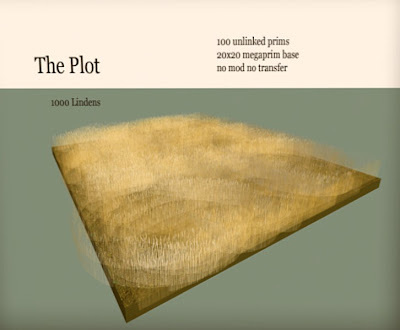 On September 22, 2007, the avatar and content creator, AM Radio, set out some plots of wheat for sale on the land where his own, much celebrated virtual wheat field in Second Life sits, known as The Far Away. Teleport directly from here. His idea was a simple one: all proceeds from each sale would be forwarded to Heifer International, an organization that works to end hunger and poverty by providing livestock and environmentally sound agricultural training to improve the lives of people who struggle daily for dependable sources of food and income. His initial fundraising goal: $500 US dollars... enough to buy a heifer cow for a family. Today - six weeks since he began this project - he is just short $55 US dollars from his newest goal of buying not one, but two cows. 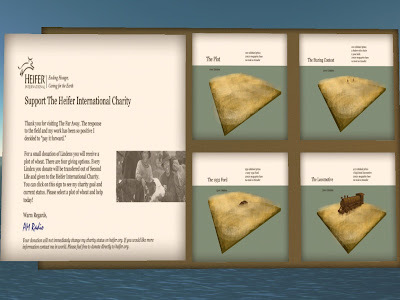 In fact, even though all the funds have not yet posted on the Heifer website because they are still being transfered over via PayPal, AM Radio's virtual fundraiser ranks him as the fifth largest contributor in the Team Heifer program. "A good dairy cow can produce four gallons of milk a day - enough for a family to drink and share with neighbors. Milk protein transforms sick, malnourished children into healthy boys and girls. The sale of surplus milk earns money for school fees, medicine, clothing and home improvements. And because a healthy cow can produce a calf every year, every gift will be passed on and eventually help an entire community move from poverty to self reliance."